WILLEMSTAD - Eunice Saleh was sworn in as new President of the Joint Court of Justice of Aruba, Curaçao, Sint Maarten and Bonaire, St. Eustatius and Saba last week Thursday. She is second President of the Court of Justice of the Saleh family; her father Jaime Saleh, who was also Governor of the Netherlands Antilles, preceded her in 1979. 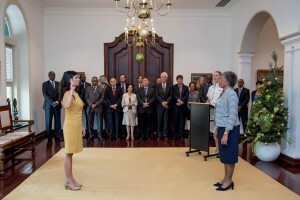 The Governor of Curaçao, Lucille George-Wout, swore her in. Saleh (1966) succeeds Evert van der Poel, who will step down on January 1, 2017. Van der Poel had indicated when he took office in April 2013 that he would temporarily fill the post of president. He advocated for a Caribbean successor. Saleh is a member of the Joint Court and also vice president of the Court.